Friends, if you’ve stayed with me throughout these trying times, you are all saints. We have at last reached the end of these old reviews I found sitting around on an old external hard drive, meaning that we will shortly be returning you to the regularly-scheduled amount of overwrought verbiage and incomprehensible sarcasm. I am just as relieved as you. Is that supposed to be an ape hand or something? Although Converge had long been one of extreme music’s most respected and hard-working bands, the landmark acclaim and success they achieved with 2001’s Jane Doe guaranteed that crafting a follow-up that satisfied fans and critics without sacrificing their creative progression would be no small task. With You Fail Me, however, Converge has again succeeded admirably, delivering a swift kick to the head of all those who would doubt their conviction or ability to continue producing scathingly intense music with a very real emotional core. For the most part, the songs on You Fail Me display many of Converge’s trademarks: furiously churning guitars that duel and collide with the drums to form chaotic, echoing rhythms, Jacob Bannon’s tortured, animalistic wailing, and breakneck tempos. Nowhere is this tradition better upheld than in standout tracks such as “Black Cloud,” “Eagles Become Vultures,” and “Heartless,” with its stuttering, chanting finale. What truly makes this album stand out from the rest of Converge’s thoroughly accomplished oeuvre are the small refinements of their sound. For example, the mesmerizing guitar melody that carries the latter half of “Drop Out” helps to elevate the lyrics above the whipping maelstrom of the drums and bass. “First Light” begins the album with a melancholic solo guitar line so languid that it threatens to dissipate into pure feedback. “Last Light” offers another unique take on Converge’s often barely controlled chaos: more so than on any other song, it is the propulsive drums that carry this piece all the way through, from the simple guitar chords of its intro to the convulsive breakdown at its conclusion. The true heart of this album, however, must be the back-to-back ordering of its two longest songs, “You Fail Me” and “In Her Shadow.” The monstrous title track is deceptively simple, but its power comes from its sheer bludgeoning force. Though a simple, plodding rhythm forms the song’s foundation, more layers are gradually added, and when the song reaches its peak, the results are truly massive. “In Her Shadow,” as it opens with a gently strummed acoustic guitar, would seem to be a welcome respite from the blistering title track. Gradually, though, it becomes something much more sinister. The vocals throughout are ghostly, mirroring the feedback in which the whole piece is awash. As the song progresses, it builds and builds, always threatening to overtake itself. Once the drums enter, they lead the song into martial disarray, and by the time the song reaches its climax, the drums are about all that can be reasonably distinguished from the underlying chaos; in fact, certain moments of this song wouldn’t be out of place on a Neurosis album. In the end, though, what makes this album so convincing, like Jane Doe before it, is that it brutally pummels the listener not just with aggression, but also with emotion. You Fail Me is significantly shorter than Jane Doe, however, and the emotional tone is markedly different as well. No matter what one may be able to decipher from Jacob Bannon’s excellent lyrics, it is indisputable that there lies at the core of them some real anguish. Although Jane Doe had its fair share of anger, there was hope, too, perhaps most notably in the way the closing track faded out amidst Bannon’s glorious shouts of “Run on!” By contrast, the anger throughout You Fail Me feels a bit more resigned, a bit more desperate. On the closing track, “Hanging Moon,” Bannon begins his entreaty of “Be my light in this world of darkness,” but the song, and the album, cuts him tragically short, allowing only for the words “Be my…” Perhaps there is hope in that, too. What is certain, however, is that Converge has made another haunting record that is just as likely to make you weep as it is to kick in your teeth. Okay, well maybe that one wasn’t so bad. Back up to my typical standards of pretension, at least. Seriously, though: Can you imagine many other bands, following up an album as thoroughly-masturbated-about as Jane Doe, putting out such an abrasively honest, emotionally-damaged statement as this? 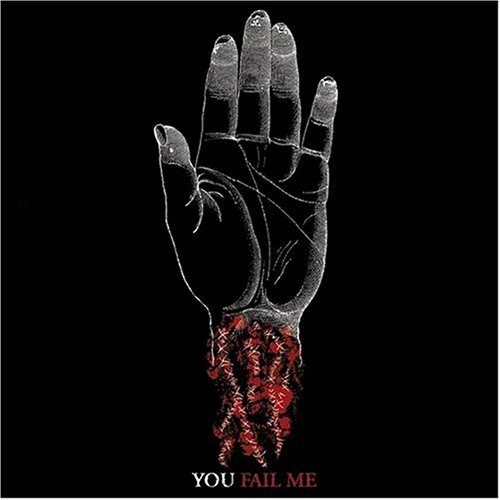 You Fail Me remains, in my opinion, a criminally underrated episode in Converge’s rightly-feted discography. Anyway, that’s it for my vault-plundering exploits. Thanks for coming along for the ride; sorry about all the sick in the passenger’s seat. Occupational hazard of reading old writing, I figure. Be my light in this world of darkness, won’t you?